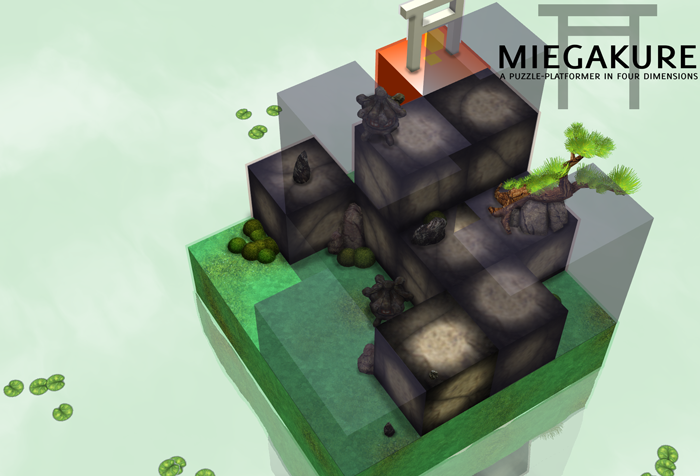 Miegakure is a platform game where you explore the fourth dimension to solve puzzles. Our world is three-dimensional: width, depth, and height. But what if there was a fourth physical dimension that we cannot see, in addition to the other three? This game is about exploring the consequences of being able to move in four spatial dimensions. It plays like a regular three-dimensional platformer, but at the press of a button one of the dimensions is exchanged with the fourth dimension, allowing for four-dimensional movement. Think about a two-dimensional character living on a horizontal, flat two-dimensional plane. To this character, height would be a foreign concept. A number of actions we three-dimensional beings take for granted feel like absolute magic to this two-dimensional character. For example, if there is a wall in the shape of a circle around an object in 2D, it is essentially closed-off, since to reach it one would have to leave the 2D plane. It is also impossible for an outsider to know what is inside. The game medium makes the mathematical concept of a fourth dimension easier to understand by allowing to experience it first-hand, using trial and error, as opposed to being told about it. The game is currently in development and the goal is to release it in downloadable form for consoles and PC/Mac/Linux. There is no announced date and platform yet. There is no publicly released demo at this point. There will be one when the game is released though, so please be patient 🙂 Thanks. Thanks X64 for letting us know about this game. Nice to see a new post on here. Hope things are going okay with you Maxim.